One of the top spots on my to-do list for Spring is always detoxing my closet. Going through and purging pieces I won’t miss, and adding a few fresh staples always sets a crisp tone for a new season. Between low energy, skin issues, and not feeling like myself as of late, I decided a revamp my nutrition, as well. I found a plant based 30 day program to promote energy, better sleep, weight loss, muscle tone, and clearer skin and relieve bloating and inflammation. Unlike “cleanses” I have tried in the past, this has been the easiest program to follow, (no counting, juicing, or meal skipping involved! ), and I have felt not only full each day, but healthier, more toned, sans bloat and headaches. 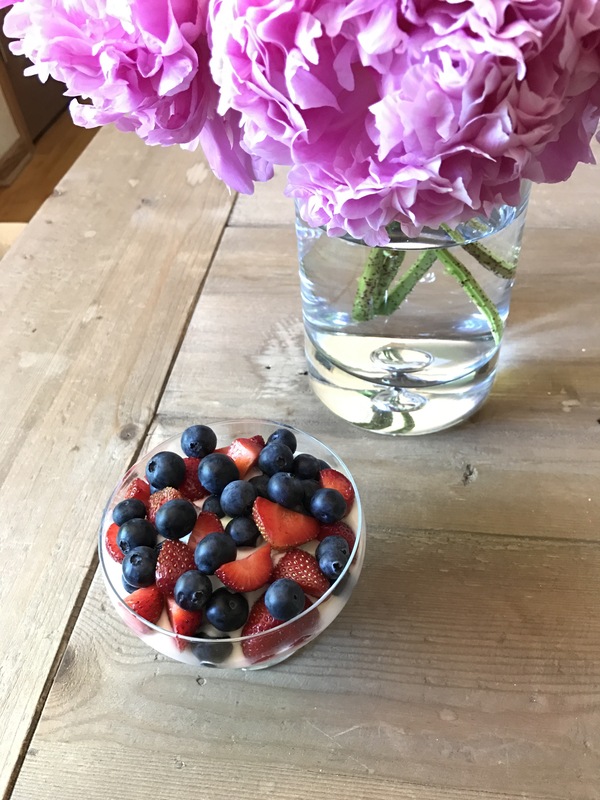 I’m not even half-way through the program, and I feel that it was exactly what I needed to get back on track with clean eating, and nutrition based meals, and a vast boost of energy! My favorite go-to salad lately is a Mediterranean detox salad. It’s super simple to meal prep, without becoming soggy like other greens! Not only is it delicious, but there are countless health benefits to the ingredients. The versatility of the salad makes it easy to mix things up for the week, by eating the salad for lunch or dinner, or stuffing it into a grain-free wrap with a scoop of hummus for a protein packed meal! So so good! If you’re in need of a Spring detox, or could use help with meal plans, recipes and clean eating, I’d love to chat! I’ve always loved fruit & oatmeal for breakfast, but recently I have been adding a new spin, which is full of protein and tastes amazing! It’s super easy to meal prep too! I make a batch on Sunday and prep 4 bowls for the week. To make the oatmeal, add oatmeal, water, cinnamon, and salt to a pot and bring to a boil. Reduce heat and simmer, uncovered, for 5 minutes. Remove from heat and let cool. Once cooled, add to a bowl, and layer on yogurt and fresh berries. Enjoy! I always look forward to my go-to breakfast, a tofu scramble loaded with veggies, cashew cheese, a drizzle of hot sauce and a slice of toast, but there’s something about Sunday mornings that makes me crave sweet indulgences. 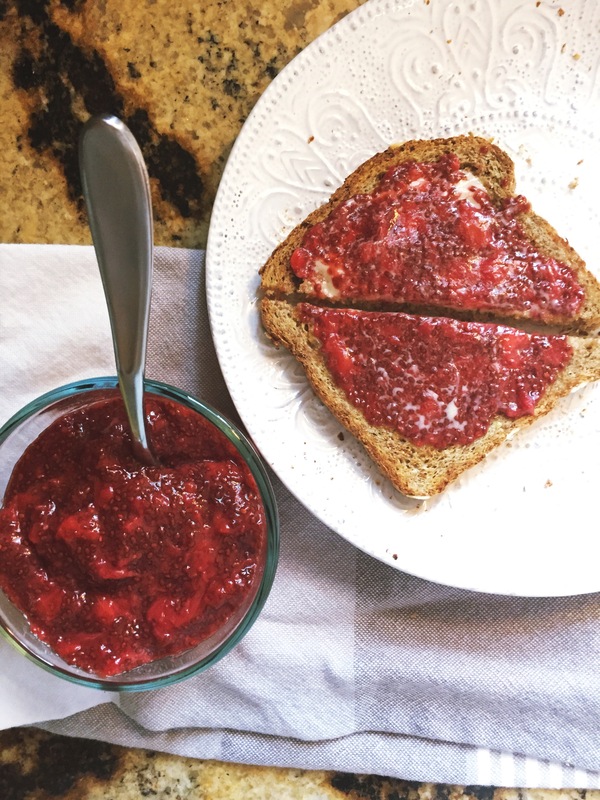 This weekend, I decided to try to whip up strawberry chia seed jam. 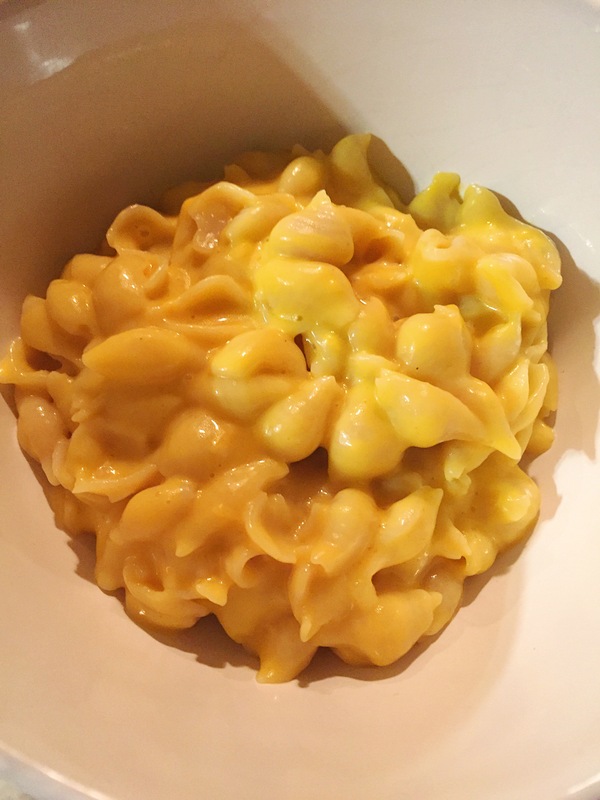 I can’t believe I haven’t tried it in the past, it was so quick and easy and tastes absolutely delicious! It was amazing on sprouted grain toast with Earth Balance butter, but I can’t wait to try out thumbprint cookies for Christmas using the fresh jam! The fact that it’s guilt-free makes is an added bonus! Place a bag of frozen organic strawberries into a pot and mash with a potato masher as they begin to cook. Once cooked through and mashed, add agave nectar to taste. Next add a generous amount of chia seeds until a thick consistency is reached. Transfer to a glass jar or bowl and let cool. Once cooled, seal the chia seed jam and place in the fridge to let flavors marry, for best taste! I make my favorite banana bread recipe all the time. I decided to switch it up create a pumpkin version. The result? A super moist bread, with the perfect amount of flavor! My favorite hue I shared last week lasted me 9 whole days! My usual run is 3-4 with polish. This polish & top coat are amazing. Old Navy is having a 30% off sale today only online! Stock up on Spring staples, and cute sandals for a fraction of the price, no code needed! I couldn’t be more excited for Spring weather and more fresh veggies available. I like to switch up my salads frequently with a variety of proteins, veggies, healthy fats and omega-3s. I swap out everything from vegan chicken, to sunflower seeds, to beets to keep it from getting boring. Prepping veggies early in the week, make this simple, yet nutrient packed salad easy to throw together for lunch or dinner. Start out with a base. I love fresh romaine, and I wash and cut it up early in the week so salads are easily accessible. I deseed veggies like cucumbers and tomatoes, and cut up red onion. Healthy fats like fresh avocado, walnuts and sunflower seeds keep it filling. I always add a couple protein options like garbanzo beans, tofu, tempeh or veggie chicken strips. My favorite vinaigrette is equal parts Organic Extra Virgin Olive Oil and Organic Red Wine Vinegar, mixed with Pink Himalayan Salt, Fresh Ground Black Pepper, Granulated Garlic and Oregano. What are your favorite salad combos? One of my favorite lunch spots serves healthy Lebanese-American food. I love that they offer healthy and nutritious options on their menu like quinoa, kale, brown rice and fresh veggies. A dish I usually crave is made with well seasoned brown rice, beans, cooked vegetables, and topped with fresh Lebanese Salata. I had a serious craving for it and decided to recreate a version of my own. If you like food with a spicy kick, the mix of flavors is amazing! Add bouillon cube to 2 cups hot water, mix well, and set aside to dissolve. In a large pot, on medium heat, add olive oil and garlic and cook 1-2 minutes. Stir in spices and rice and mix well, cooking for 5-7 minutes. Add bouillon water and bring to a boil. Reduce heat to low, cover and simmer for 25-30 minutes, or until water has absorbed. While Rice is cooking, chop cucumbers and tomatoes. Add to a medium bowl, and add lemon juice, parsley, granulated garlic, and salt and pepper to taste. When rice is done cooking, add frozen peas, and beans, and stir well. Let cook 5-7 minutes. Add salt and pepper to taste. Add rice & beans to your bowl and top with fresh salata. Enjoy! *You can easily add grilled chicken to this dish, as well! Happy National Pizza Day! Pizza is one of my biggest weaknesses and (& biggest cravings!) So I try to make it as guilt-free as possible whenever I make it myself. Gluten free/vegan crust isn’t exactly the most cooperative recipe to make most of the time. I found this recipe, which if rolled out thinly, and added flour, it has been the most successful crust recipe I’ve made thus far. After following the crust recipe, and baking accordingly, I evenly spread the pureed San Marzano tomatoes to the crust by the spoonful. Next I sprinkle granulated garlic. I cover with vegan cheese shreds, then top with sliced mushrooms and fresh basil. The ingredients marry together so well for a subtle burst of flavor.